The Ramesh K. Gandhi Medical Education Center (also known as White Hall) is at the front of the campus facing Colonel Glenn Highway. 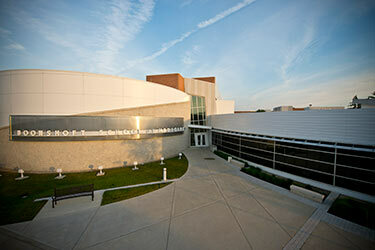 Scroll down to view a map showing where the campus is in the Greater Dayton area or view an interactive map showing where White Hall is on campus. From north of Dayton on I-75. Take I-75 south to I-70 east. Go east to I-675 south. Go south to Exit 17 and turn right onto North Fairfield Road. Travel about 1/2 mile to Col. Glenn Highway. Turn left onto Col. Glenn Highway at the traffic light in front of the Nutter Center. Turn right onto campus at Center Road. To go to White Hall, take your first left and park in Lot 16 in front of the building. From south of Dayton on I-75. Take I-75 north to I-675 north. Go north to Exit 17 and follow the right fork of the exit ramp (do not follow the signs to Wright State). Turn left on North Fairfield Road. Travel about 1/2 mile to Col. Glenn Highway. Turn left onto Col. Glenn Highway at the traffic light in front of the Nutter Center. Turn right onto campus at Center Road. To go to White Hall, take your first left and park in Lot 16 in front of the building. From east of Dayton on I-70. Take I-70 west to I-675 south. Go south to Exit 17 and turn right onto North Fairfield Road. Travel about 1/2 mile to Col. Glenn Highway. Turn left onto Col. Glenn Highway at the traffic light in front of the Nutter Center. Turn right onto campus at Center Road. To go to White Hall, take your first left and park in Lot 16 in front of the building. From west of Dayton on I-70. Take I-70 east to I-675 south. Go south to Exit 17 and turn right onto North Fairfield Road. Travel about 1/2 mile to Col. Glenn Highway. Turn left onto Col. Glenn Highway at the traffic light in front of the Nutter Center. Turn right onto campus at Center Road. To go to White Hall, take your first left and park in Lot 16 in front of the building. From east of Dayton on Route 35. Take Route 35 west to North Fairfield Road. Turn left onto North Fairfield Road. Travel about 5 miles to Col. Glenn Highway. Turn left onto Col. Glenn Highway at the traffic light in front of the Nutter Center. Turn right onto campus at Center Road. To go to White Hall, take your first left and park in Lot 16 in front of the building. From west of Dayton on Route 35. Take Route 35 east to I-675 north. 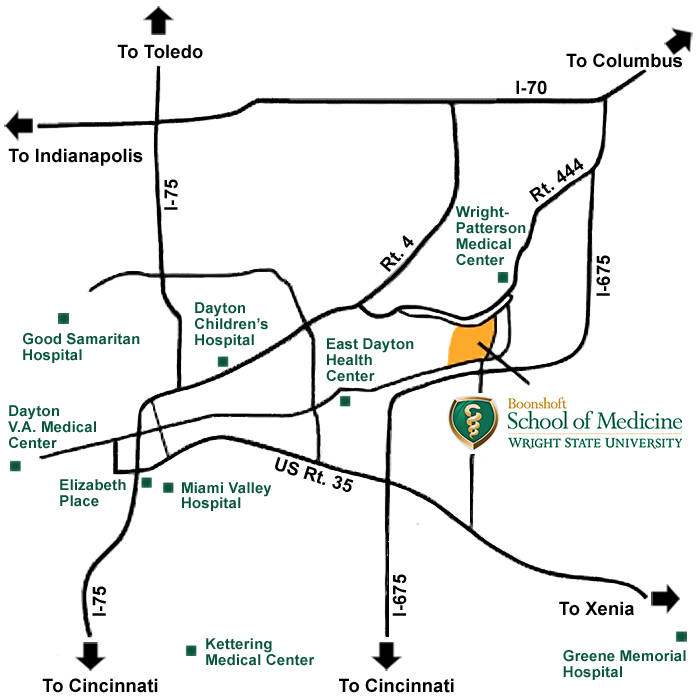 Go north to Exit 17 and follow the right fork of the exit ramp (do not follow the signs to Wright State). Turn left on North Fairfield Road. Travel about 1/2 mile to Col. Glenn Highway. Turn left onto Col. Glenn Highway at the traffic light in front of the Nutter Center. Turn right onto campus at Center Road. To go to White Hall, take your first left and park in Lot 16 in front of the building.